This one's honestly a winner. It's unbelievably easy and it goes with almost anything: roasted vegetables, fries, crackers, wraps, yum bowls, savory pancakes, and so much more. This appetizer recipe in particular can make you feel fancy without even trying. 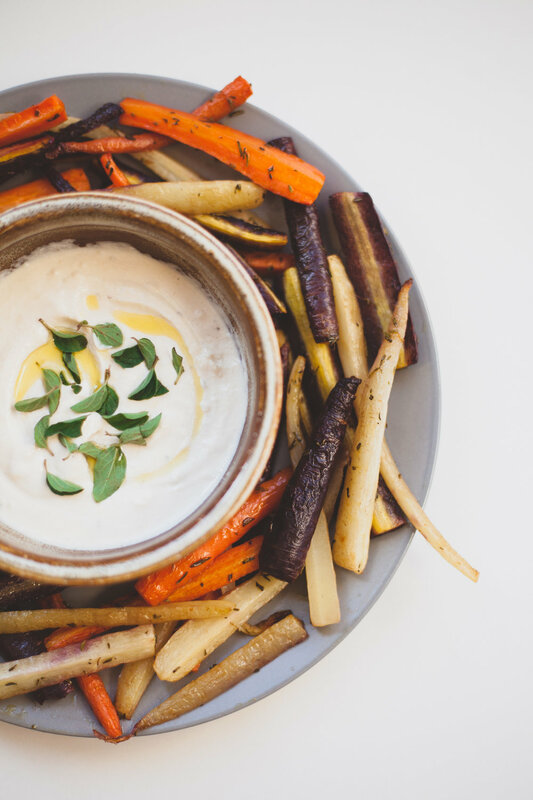 I was inspired to make these carrots and dip after a friend made something similar at her house. The sauce is a spin on the tahini sauce that I normally make. The greek yogurt adds a lighter, creamier consistency that is so fulfilling. Try it out this week! Preheat the oven to 400. Slice the carrots lengthwise, coat in olive oil, chopped herbs, salt and pepper. Bake in the oven for 30 minutes, or until soft. While the carrots are baking, combine all of the sauce ingredients. Add more water if you want a thinner sauce.